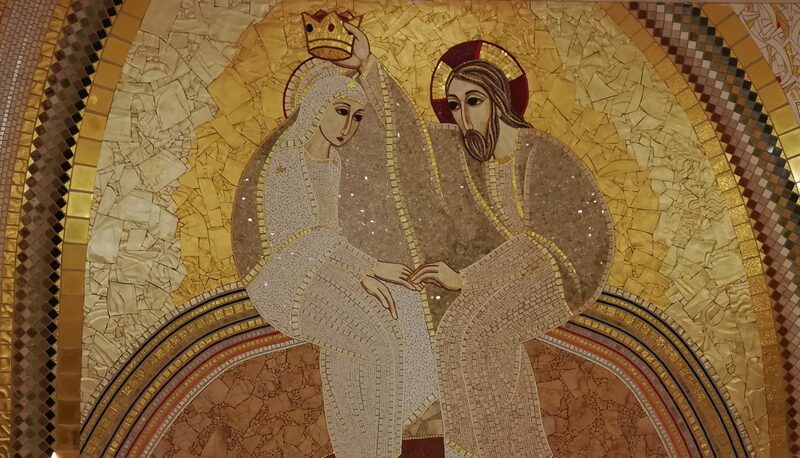 As a follow up to my previous post of the transcript of my Women’s Lenten talk, I have uploaded the audio to my Vimeo channel. There’s nothing to watch, it’s just audio. Still awaiting the full video of all three of the talks from that night. But in the meantime, here is the talk. Note – You’ll probably have to put the volume up as high as you can go in order to hear me. I had the honor of being asked to give a brief talk to a group of women at a parish in Detroit called Shrine of the Little Flower. This was a women’s Lenten Retreat and I was one of three speakers invited to talk to a group of about 75 women in attendance. So the good news is that I did record this talk via my phone but the bad news is that the volume ended up being really low. But the GREAT news is that thankfully, the entire evening was video recorded! As I anxiously await for a copy to upload to Vimeo, I thought I’d at least share the transcript of the talk, although I definitely did not stick to this script completely. The parts in bold are just there to make sure I mentioned them and didn’t forget. Enjoy! Thank you! So first off I just have to mention that this reminds me of the first retreat I went on as a young adult. It 6 years ago, right around this time of the year almost exactly. Because it was two weeks after my mom passed on March 10, 2013. And on that retreat, I met other young adults, people around my age, who talked and spoke differently. Like they knew God in a different way. I wasn’t intimidated by them or anything. In fact, it’s safe to say I wanted what they had! I started to go on more retreats and I found these people to be the first ones who really taught me what a real relationship with God is like! They sparked something in me to take a second look at my relationship with God. And it was on yet another retreat where I was prompted to pursue and study Theology of the Body, which was the main catalyst that brought me to the point where I am today and my relationship with our awesome God. Theology of the Body is 600 pages long so I wouldn’t expect anyone here to read it..BUT, if after my talk you are inclined to learn more, I promise there are a ton of digestable resources/videos and books that I can recommend. For our purposes tonight, I wanted to talk about how TOB helps us rediscover our identity, as it did for me. Or maybe we believed the lies that exboyfriends or former friends told us about ourselves and therefore we think – this is who I am. Or “I am stuck in this way of life and that’s all there is to it and there’s no hope.” So many of us are wounded by sin, especially by men, whether that be fathers or husbands or boyfriends. And that’s really where TOB comes in to play because we can receive healing from it, once we understand why Jesus came. Because He came to heal us, to restore our identity. And that’s really good news! And He can heal us of those distorted images of our identity. So one way in which I was able to rediscover my identity is how JP2 unpacked God’s original plan for us. He took us back to the beginning in the Garden of Eden to show us that look, God didn’t intend for us to have this ruptured relationship with each other and with Him and with ourselves. That’s what sin did, it ruptured these relationships. But if we go back before original sin, we see the real beauty of that original relationship between man and God in the garden. and when man and woman looked at one another for the first time, they knew the truth – that we are made for relationship. That’s what it means to be human – created in the image and likeness of God. And made for relationship. Man discovered who he was in light of woman, and woman discovered who she was in light of seeing him. That the body is sacred. That we don’t have bodies, these aren’t shells – we ARE Bodies. And our bodies speak a language. That the body matters. I wasn’t created to be used by another. Young ladies need to hear this – We were not created to be used and objectified. We were created to LOVE. We were created for Union. For relationship. And Love is not using someone as a means to an end, as an object for pleasure and satisfaction. No, that’s another lie of the evil one. That’s what sin does, it distorts and cheapens our true identity. There’s one particular aspect of TOB that really struck me: JP2 speaks about this “echo” in all of us. This echo of the beginning. That we know deep down that we were made for more. That there is more to life than this. That this, as great as it is, is not our final home. That I was made for more. TOB makes it clear that we have ACCESS To that. We have access to God’s original plan for our lives! This is really good news! We can access it by grace and taking part in the Sacraments. I can pray to God to help me be healed of these distorted views and perceptions of myself and OTHERS and of my body, my body image issues that I may have, and I can live my life in such a way that I don’t have to be bogged down by sin. Yes we are all sinners and yes we live in a fallen world, but that’s not the end of the story. Because, guess what, Jesus came! He came to restore our identities and heal us. In the beginning, it was not so…what was not so? SIN! Lust, divorce, use, mistrust, degradation of the body. We have access to that life before sin distorted everything. We won’t ever be 100% perfect – not until we’re in union with Him in heaven but in the meantime, we can strive for holiness…that universal call to holiness is no joke. So if you have a distorted twisted or just an unclear view of who you are – if you are struggling with your identity, I would really just pray for the lord to reveal to you the lies that you have believed so you can be healed with the truth. He is the divine physician and TOB teaches us that yes, with God’s grace, we CAN change, We CAN heal we can Love because we ARE loved. One last key point – Confession. I don’t think it was an accident that I came back to the Sacrament of Reconciliation after being away from it for 23 years at my first TOB course/retreat 4 years ago. Let me tell you, there’s no greater feeling than walking out of the confessional having been forgiven by God for your sins. Being lent, we’re wearing purple for a reason. Let me just gently nudge you if you have been away for awhile to come back. I love going to confession and I love having a spiritual director – that’s really key for me. Let me close with this – Are you familiar with the scripture passage from St. Paul that says “It Is not I who lives but Christ who lives in me?” I used to read that and not think that it was possible. I thought that was just for super holy people. But you know what? That’s for all of us! And what’s awesome is now I read it and I think to myself – YES that’s me!!! I was lost but now I’m found. My life isn’t perfect by any means, but now I read that line and I get it. Every day I need the Lord to remind me to put off the old self and put on the new self. I don’t know if anything I’ve said tonight resonates with you but at least let me close with this – We can all do this with God’s grace. We can change. We don’t have to be (and shouldn’t be) content to live in sin. So I hope I have encouraged you to put on a new life in Christ and Rediscover your Identity as a beloved daughter of God. As you can see from the agenda I shared, it was a great little evening and all three of our talks were very well received and appreciated.